For the taxonomic method, see DNA barcoding. A barcode (also bar code) is a visual, machine-readable representation of data; the data usually describes something about the object that carries the barcode. Traditional barcodes systematically represent data by varying the widths and spacings of parallel lines, and may be referred to as linear or one-dimensional (1D). Later, two-dimensional (2D) variants were developed, using rectangles, dots, hexagons and other geometric patterns, called matrix codes or 2D barcodes, although they do not use bars as such. Initially, barcodes were only scanned by special optical scanners called barcode readers. Later application software became available for devices that could read images, such as smartphones with cameras. IBM offered to buy the patent, but the offer was not accepted. Philco purchased the patent in 1962 and then sold it to RCA sometime later. In 1966, the National Association of Food Chains (NAFC) held a meeting on the idea of automated checkout systems. RCA, who had purchased the rights to the original Woodland patent, attended the meeting and initiated an internal project to develop a system based on the bullseye code. The Kroger grocery chain volunteered to test it. In the spring of 1971, RCA demonstrated their bullseye code at another industry meeting. IBM executives at the meeting noticed the crowds at the RCA booth and immediately developed their own system. IBM marketing specialist Alec Jablonover remembered that the company still employed Woodland, and he[who?] established a new facility in North Carolina to lead development. In July 1972, RCA began an 18-month test in a Kroger store in Cincinnati. Barcodes were printed on small pieces of adhesive paper, and attached by hand by store employees when they were adding price tags. The code proved to have a serious problem; the printers would sometimes smear ink, rendering the code unreadable in most orientations. However, a linear code, like the one being developed by Woodland at IBM, was printed in the direction of the stripes, so extra ink would simply make the code "taller" while remaining readable. So on 3 April 1973, the IBM UPC was selected as the NAFC standard. IBM had designed five versions of UPC symbology for future industry requirements: UPC A, B, C, D, and E.
In 1971, an IBM team was assembled for an intensive planning session, threshing out, 12 to 18 hours a day, how the technology would be deployed and operate cohesively across the system, and scheduling a roll-out plan. By 1973, the team were meeting with grocery manufacturers to introduce the symbol that would need to be printed on the packaging or labels of all of their products. There were no cost savings for a grocery to use it, unless at least 70% of the grocery's products had the barcode printed on the product by the manufacturer. IBM projected that 75% would be needed in 1975. Yet, although this was achieved, there were still scanning machines in fewer than 200 grocery stores by 1977. In 1981, the United States Department of Defense adopted the use of Code 39 for marking all products sold to the United States military. This system, Logistics Applications of Automated Marking and Reading Symbols (LOGMARS), is still used by DoD and is widely viewed as the catalyst for widespread adoption of barcoding in industrial uses. The mapping between messages and barcodes is called a symbology. The specification of a symbology includes the encoding of the message into bars and spaces, any required start and stop markers, the size of the quiet zone required to be before and after the barcode, and the computation of a checksum. Characters in discrete symbologies are composed of n bars and n − 1 spaces. There is an additional space between characters, but it does not convey information, and may have any width as long as it is not confused with the end of the code. Characters in continuous symbologies are composed of n bars and n spaces, and usually abut, with one character ending with a space and the next beginning with a bar, or vice versa. A special end pattern that has bars on both ends is required to end the code. A two-width, also called a binary bar code, contains bars and spaces of two widths, "wide" and "narrow". The precise width of the wide bars and spaces is not critical; typically it is permitted to be anywhere between 2 and 3 times the width of the narrow equivalents. Some other symbologies use bars of two different heights (POSTNET), or the presence or absence of bars (CPC Binary Barcode). These are normally also considered binary bar codes. Bars and spaces in many-width symbologies are all multiples of a basic width called the module; most such codes use four widths of 1, 2, 3 and 4 modules. Some symbologies use interleaving. The first character is encoded using black bars of varying width. The second character is then encoded by varying the width of the white spaces between these bars. Thus characters are encoded in pairs over the same section of the barcode. Interleaved 2 of 5 is an example of this. Stacked symbologies repeat a given linear symbology vertically. The most common among the many 2D symbologies are matrix codes, which feature square or dot-shaped modules arranged on a grid pattern. 2D symbologies also come in circular and other patterns and may employ steganography, hiding modules within an image (for example, DataGlyphs). Linear symbologies are optimized for laser scanners, which sweep a light beam across the barcode in a straight line, reading a slice of the barcode light-dark patterns. Scanning at an angle makes the modules appear wider, but does not change the width ratios. Stacked symbologies are also optimized for laser scanning, with the laser making multiple passes across the barcode. In the 1990s development of charge coupled device (CCD) imagers to read barcodes was pioneered by Welch Allyn. Imaging does not require moving parts, as a laser scanner does. In 2007, linear imaging had begun to supplant laser scanning as the preferred scan engine for its performance and durability. 2D symbologies cannot be read by a laser, as there is typically no sweep pattern that can encompass the entire symbol. They must be scanned by an image-based scanner employing a CCD or other digital camera sensor technology. The right pictures show the red laser of barcode readers gets of the images behind the filter. Barcode scanners can be classified into three categories based on their connection to the computer. The older type is the RS-232 barcode scanner. This type requires special programming for transferring the input data to the application program. "Keyboard interface scanners" connect to a computer using a PS/2 or AT keyboard–compatible adaptor cable (a "keyboard wedge"). The barcode's data is sent to the computer as if it had been typed on the keyboard. Like the keyboard interface scanner, USB scanners are easy to install and do not need custom code for transferring input data to the application program. On PCs running Windows the HID interface emulates the data merging action of a hardware "keyboard wedge", and the scanner automatically behaves like an additional keyboard. Many phones are able to decode barcodes using their built-in camera, as well. Google's mobile Android operating system uses both their own Google Goggles application or third party barcode scanners like Scan. Nokia's Symbian operating system features a barcode scanner, while mbarcode is a QR code reader for the Maemo operating system. In Apple iOS 11, the native camera app can decode QR codes and can link to URLs, join wireless networks, or perform other operations depending on the QR Code contents. Other paid and free apps are available with scanning capabilities for other symbologies or for earlier iOS versions. With BlackBerry devices, the App World application can natively scan barcodes and load any recognized Web URLs on the device's Web browser. Windows Phone 7.5 is able to scan barcodes through the Bing search app. However, these devices are not designed specifically for the capturing of barcodes. As a result, they do not decode nearly as quickly or accurately as a dedicated barcode scanner or portable data terminal. Barcode verification examines scanability and the quality of the barcode in comparison to industry standards and specifications. Barcode verifiers are primarily used by businesses that print and use barcodes. Any trading partner in the supply chain can test barcode quality. It is important to verify a barcode to ensure that any reader in the supply chain can successfully interpret a barcode with a low error rate. Retailers levy large penalties for non-compliant barcodes. These chargebacks can reduce a manufacturer's revenue by 2% to 10%. Depending on the parameter, each ANSI test is graded from 0.0 to 4.0 (F to A), or given a pass or fail mark. Each grade is determined by analyzing the scan reflectance profile (SRP), an analog graph of a single scan line across the entire symbol. The lowest of the 8 grades is the scan grade, and the overall ISO symbol grade is the average of the individual scan grades. For most applications a 2.5 (C) is the minimal acceptable symbol grade. Compared with a reader, a verifier measures a barcode's optical characteristics to international and industry standards. The measurement must be repeatable and consistent. Doing so requires constant conditions such as distance, illumination angle, sensor angle and verifier aperture. Based on the verification results, the production process can be adjusted to print higher quality barcodes that will scan down the supply chain. Barcode verifiers should comply with the ISO/IEC 15426-1 (linear) or ISO/IEC 15426-2 (2D). This standard defines the measuring accuracy of a barcode verifier. The current international barcode quality specification is ISO/IEC 15416 (linear) and ISO/IEC 15415 (2D). The European Standard EN 1635 has been withdrawn and replaced by ISO/IEC 15416. The original U.S. barcode quality specification was ANSI X3.182. (UPCs used in the US – ANSI/UCC5). This standard defines the quality requirements for barcodes and matrix codes (also called optical codes). As of 2011 the ISO workgroup JTC1 SC31 was developing a Direct Part Marking (DPM) quality standard: ISO/IEC TR 29158.
International standards are available from the International Organization for Standardization (ISO). These standards are also available from local/national standardization organizations, such as ANSI, BSI, DIN, NEN and others. Besides sales and inventory tracking, barcodes are very useful in logistics and supply chain management. Barcode scanners are relatively low cost and extremely accurate compared to key-entry, with only about 1 substitution error in 15,000 to 36 trillion characters entered. [unreliable source?] The exact error rate depends on the type of barcode. A first generation, "one dimensional" barcode that is made up of lines and spaces of various widths that create specific patterns. Australia Post barcode Discrete 4 bar heights An Australia Post barcode as used on a business reply paid envelope and applied by automated sorting machines to other mail when initially processed in fluorescent ink . GS1-128 (formerly named UCC/EAN-128), incorrectly referenced as EAN 128 and UCC 128 Continuous Many Various, GS1-approved – just an application of the Code 128 (ISO/IEC 15417) using the ANS MH10.8.2 AI Datastructures. It is not a separate symbology. AR Code A type of marker used for placing content inside augmented reality applications. Some AR Codes can contain QR codes inside, so that content AR content can be linked to. See also ARTag. BEEtag A 25 bit (5x5) code matrix of black and white pixels that is unique to each tag surrounded by a white pixel border and a black pixel border. The 25-bit matrix consists of a 15-bit identity code, and a 10-bit error check. It is designed to be a low-cost, image-based tracking system for the study of animal behavior and locomotion. BeeTagg A 2D barcode with honeycomb structures suitable for mobile tagging and was developed by the Swiss company connvision AG. Bokode A type of data tag which holds much more information than a barcode over the same area. They were developed by a team led by Ramesh Raskar at the MIT Media Lab. The bokode pattern is a tiled series of Data Matrix codes. Code 16K The Code 16K (1988) is a multi-row bar code developed by Ted Williams at Laserlight Systems (USA) in 1992. In the USA and France, the code is used in the electronics industry to identify chips and printed circuit boards. Medical applications in the USA are well known.Williams also developed Code 128, and the structure of 16K is based on Code 128. Not coincidentally, 128 squared happened to equal 16,000 or 16K for short. Code 16K resolved an inherent problem with Code 49. Code 49's structure requires a large amount of memory for encoding and decoding tables and algorithms. 16K is a stacked symbology. Color Construct Code Color Construct Code is one of the few barcode symbologies designed to take advantage of multiple colors. CrontoSign (also called photoTAN) is a visual cryptogram containing encrypted order data and a transaction authentication number. Patented. DataGlyphs can be embedded into a half-tone image or background shading pattern in a way that is almost perceptually invisible, similar to steganography. Data Matrix From Microscan Systems, formerly RVSI Acuity CiMatrix/Siemens. Public domain. Increasingly used throughout the United States. Single segment Data Matrix is also termed Semacode. – International Standard: ISO/IEC 16022.
digital paper patterned paper used in conjunction with a digital pen to create handwritten digital documents. The printed dot pattern uniquely identifies the position coordinates on the paper. DotCode Standardized as AIM Dotcode Rev 3.0. Public domain. Used to track individual cigarette and pharmaceutical packages. Dot Code A Also known as Philips Dot Code. Patented in 1988. EZcode Designed for decoding by cameraphones; from ScanLife. Han Xin Barcode Barcode designed to encode Chinese characters introduced by Association for Automatic Identification and Mobility in 2011. High Capacity Color Barcode HCCB was developed by Microsoft; licensed by ISAN-IA. JAB-Code Just Another Bar Code is a colored 2D barcode. MaxiCode Used by United Parcel Service. Now public domain. mCode Designed by NextCode Corporation, specifically to work with mobile phones and mobile services. It is implementing an independent error detection technique preventing false decoding, it uses a variable-size error correction polynomial, which depends on the exact size of the code. NexCode NexCode is developed and patented by S5 Systems. Qode American proprietary and patented 2D barcode from NeoMedia Technologies, Inc.
Screencode Developed and patented  by Hewlett-Packard Labs. A time-varying 2D pattern using to encode data via brightness fluctuations in an image, for the purpose of high bandwidth data transfer from computer displays to smartphones via smartphone camera input. Inventors Timothy Kindberg and John Collomosse, publicly disclosed at ACM HotMobile 2008. ShotCode Circular barcodes for camera phones. Originally from High Energy Magic Ltd in name Spotcode. Before that most likely termed TRIPCode. Snapcode, also called Boo-R code used by Snapchat, Spectacles, etc. Snowflake Code A proprietary code developed by Electronic Automation Ltd. in 1981. It is possible to encode more than 100 numeric digits in a space of only 5mm x 5mm. User selectable error correction allows up to 40% of the code to be destroyed and still remain readable. The code is used in the pharmaceutical industry and has an advantage that it can be applied to products and materials in a wide variety of ways, including printed labels, ink-jet printing, laser-etching, indenting or hole punching. Trillcode Designed for mobile phone scanning. Developed by Lark Computer, a Romanian company. VOICEYE Developed and patented by VOICEYE, Inc. in South Korea, it aims to allow blind and visually impaired people to access printed information. It also claims to be the 2D barcode that has the world's largest storage capacity. An example of a stacked barcode. Specifically a "Codablock" barcode. The QR Code for the Wikipedia URL. "Quick Response", the most popular 2D barcode. It is open in that the specification is disclosed and the patent is not exercised. 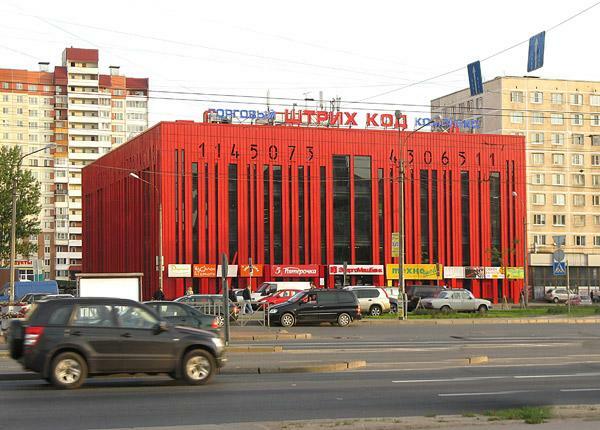 In architecture, a building in Lingang New City by German architects Gerkan, Marg and Partners incorporates a barcode design, as does a shopping mall called Shtrikh-kod (Russian for barcode) in Narodnaya ulitsa ("People's Street") in the Nevskiy district of St. Petersburg, Russia. In media, in 2011, the National Film Board of Canada and ARTE France launched a web documentary entitled Barcode.tv, which allows users to view films about everyday objects by scanning the product's barcode with their iPhone camera. In professional wrestling, the WWE stable D-Generation X incorporated a barcode into their entrance video, as well as on a T-shirt. In the TV series Dark Angel, the protagonist and the other transgenics in the Manticore X-series have barcodes on the back of their necks. In video games, the protagonist of the Hitman video game series has a barcode tattoo on the back of his head. Also, QR codes can be scanned for an extra mission on Watch Dogs. In the films Back to the Future Part II and The Handmaid's Tale, cars in the future are depicted with barcode licence plates. In the Terminator films shows Skynet burns barcodes onto the inside surface of the wrists of captive humans (in a similar location to the WW2 concentration camp tattoos) as a unique identifier. In music, Dave Davies of The Kinks released a solo album in 1980, AFL1-3603, which featured a giant barcode on the front cover in place of the musician's head. The album's name was also the barcode number. The April, 1978 issue of Mad Magazine featured a giant barcode on the cover, with the blurb "[Mad] Hopes this issue jams up every computer in the country...for forcing us to deface our covers with this yecchy UPC symbol from now on!" Some brands integrate still valid readable barcodes on their consumer products. In esotericism, the red line should remove unbalance in the lines of the barcode. While the line is kept in red color, it does not disrupt scanning the barcode. The global public launch of the barcode[when?] was greeted with minor skepticism from conspiracy theorists, who considered barcodes to be an intrusive surveillance technology, and from some Christians, pioneered by a 1982 book The New Money System 666 by Mary Stewart Relfe, who thought the codes hid the number 666, representing the "Number of the Beast." Television host Phil Donahue described barcodes as a "corporate plot against consumers". ^ a b Cranstone, Ian. "A guide to ACI (Automatic Car Identification)/KarTrak". Canadian Freight Cars A resource page for the Canadian Freight Car Enthusiast. Ian Cranstone. Retrieved 26 May 2013. ^ Keyes, John (22 August 2003). "KarTrak". John Keyes Boston photoblogger. Images from Boston, New England, and beyond. John Keyes. Archived from the original on 10 March 2014. Retrieved 26 May 2013. ^ "Why QR codes are on the rise". The Economist. 2 November 2017. Retrieved 5 February 2018. ^ Fishman, Charles (1 August 2001). "The Killer App – Bar None". American Way. Archived from the original on 12 January 2010. Retrieved 2010-04-19. ^ Seideman, Tony (Spring 1993). "Barcodes Sweep the World". AccuGraphiX / History of Bar Codes. Archived from the original on 5 November 2016. Retrieved 5 November 2016. Article published in Wonders of Modern Technology, Spring 1993. ^ Graham-White, Sean (August 1999). "Do You Know Where Your Boxcar Is?". Trains. 59 (8): 48–53. ^ Nelson, Benjamin (1997). "From Punched Cards To Bar Codes". ^ a b Varchaver, Nicholas (31 May 2004). "Scanning the Globe". Fortune. Archived from the original on 14 November 2006. Retrieved 27 November 2006. ^ a b Selmeier, Bill (2008). Spreading the Barcode. pp. 26, 214, 236, 238, 244, 245, 236, 238, 244, 245. ISBN 978-0-578-02417-2. ^ Rawsthorn, Alice (23 February 2010). "Scan Artists". nytimes.com. Retrieved 31 July 2015. ^ "World hails barcode on important birthday". ATN. Retrieved 4 July 2014. ^ "Adams1.com". Adams1.com. Retrieved 28 November 2011. ^ "Retrieved November 17, 2011". Iwatchsystems.com. 2 May 2011. Retrieved 28 November 2011. ^ Oberfield, Craig. "QNotes Barcode System". US Patented #5296688. Quick Notes Inc. Retrieved 15 December 2012. ^ David L. Hecht. "Printed Embedded Data Graphical User Interfaces" Archived 3 June 2013 at the Wayback Machine. Xerox Palo Alto Research Center. IEEE Computer March 2001. ^ Jon Howell and Keith Kotay. "Landmarks for absolute localization". Dartmouth Computer Science Technical Report TR2000-364, March 2000. ^ "IATA.org". IATA.org. 21 November 2011. Retrieved 28 November 2011. ^ "Nokia Europe – Nokia N80 – Support". ^ "package overview for mbarcode". Maemo.org. Retrieved 28 July 2010. ^ Mikah Sargent (24 September 2017). "How to use QR codes in iOS 11". iMore. Retrieved 1 October 2017. ^ "Best Barcode iPhone Applications - Barcode Scanners for iOS". 3 March 2017. Retrieved 1 October 2017. ^ "Layman's Guide to ANSI, CEN, and ISO Barcode Print Quality Documents" (PDF). Association for Automatic Identification and Data Capture Technologies (AIM). 2002. Retrieved 23 November 2017. ^ Zieger, Anne (October 2003). "Retailer chargebacks: is there an upside? Retailer compliance initiatives can lead to efficiency". Frontline Solutions. Archived from the original on 8 July 2012. Retrieved 2 August 2011. ^ Bar Code Verification Best Practice work team (May 2010). "GS1 DataMatrix: An introduction and technical overview of the most advanced GS1 Application Identifiers compliant symbology" (PDF). Global Standards 1. 1.17: 34–36. Archived (PDF) from the original on 20 July 2011. Retrieved 2 August 2011. ^ GS1 Bar Code Verification Best Practice work team (May 2009). "GS1 Bar Code Verification for Linear Symbols" (PDF). Global Standards 1 (4.3): 23–32. Retrieved 2 August 2011. ^ "Technical committees – JTC 1/SC 31 – Automatic identification and data capture techniques". ISO. Retrieved 28 November 2011. ^ "ISO web site". Iso.org. Retrieved 28 November 2011. ^ Harmon and Adams(1989). Reading Between The Lines, p.13. Helmers Publishing, Inc, Peterborough, New Hampshire, USA. ISBN 0-911261-00-1. ^ Combes, Stacey A.; Mountcastle, Andrew M.; Gravish, Nick; Crall, James D. (2 September 2015). "BEEtag: A Low-Cost, Image-Based Tracking System for the Study of Animal Behavior and Locomotion". PLOS ONE. 10 (9): e0136487. Bibcode:2015PLoSO..1036487C. doi:10.1371/journal.pone.0136487. ISSN 1932-6203. PMC 4558030. PMID 26332211. ^ Adams, Russ (15 June 2009). "2-Dimensional Bar Code Page". Archived from the original on 7 July 2011. Retrieved 6 June 2011. ^ "2-Dimensional Bar Code Page". www.adams1.com. Retrieved 12 January 2019. ^ "Code 16K Specs" (PDF). www.gomaro.ch. Retrieved 12 January 2019. ^ "Colorzip.com". Colorzip.com. Retrieved 28 November 2011. ^ "Barcodes for TV Commercials". Adverlab. 31 January 2006. Retrieved 10 June 2009. ^ "About". Colour Code Technologies. Archived from the original on 29 August 2012. Retrieved 2012-11-04. ^ "Frequently Asked Questions". ColorCCode. Archived from the original on 21 February 2013. Retrieved 4 November 2012. ^ CrontoSign Image, Cronto, archived from the original on 5 June 2016, retrieved 9 August 2014 . ^ d-touch topological fiducial recognition, MIT, archived from the original on 2 March 2008 . ^ d-touch markers are applied to deformable gloves, MIT, archived from the original on 21 June 2008 . ^ See Xerox.com for details. ^ "DataGlyphs: Embedding Digital Data". Microglyphs. 3 May 2006. Retrieved 10 March 2014. ^ ""DataGlyph" Embedded Digital Data". Tauzero. Retrieved 10 March 2014. ^ "DataGlyphs". Xerox. Retrieved 10 March 2014. ^ "Better Barcodes, Better Business" (PDF). ^ "GS1 Germany and Digimarc Announce Collaboration to Bring DWCode to the German Market". ^ "Scanbuy". Retrieved 28 November 2011. ^ a b Steeman, Jeroen. "Online QR Code Decoder". Archived from the original on 9 January 2014. Retrieved 9 January 2014. ^ "BarCode-1 2-Dimensional Bar Code Page". Adams. Archived from the original on 3 November 2008. Retrieved 2009-06-10. ^ "Global Research Solutions - 2D Barcodes". grs.weebly.com. Retrieved 12 January 2019. ^ a b Kato, Hiroko; Tan, Keng T.; Chai, Douglas (8 April 2010). Barcodes for Mobile Devices. Cambridge University Press. ISBN 9781139487511. ^ "US Patent 9270846: Content encoded luminosity modulation"
^ "US Patent 8180163: Encoder and decoder and methods of encoding and decoding sequence information with inserted monitor flags"
^ "Screen Codes: Visual Hyperlinks for Displays"
^ "Squarespace - Claim This Domain". ^ "US Patent 5825015". pdfpiw.uspto.gov. 20 October 1998. Retrieved 12 January 2019. ^ "Trillcode Barcode". Barcoding, Inc. 17 February 2009. Retrieved 12 January 2019. ^ "image". Peterburg2.ru. Retrieved 28 November 2011. ^ Lavigne, Anne-Marie (5 October 2011). "Introducing Barcode.tv, a new interactive doc about the objects that surround us". NFB Blog. National Film Board of Canada. Retrieved 7 October 2011. ^ Anderson, Kelly (6 October 2011). "NFB, ARTE France launch 'Bar Code'". Reelscreen. Retrieved 7 October 2011. ^ "Dx theme song 2009-2010". YouTube. 19 December 2009. Retrieved 10 March 2014. ^ "What about barcodes and 666: The Mark of the Beast?". Av1611.org. 1999. Retrieved 14 March 2014. ^ Bishop, Tricia (5 July 2004). "UPC bar code has been in use 30 years". SFgate.com. Archived from the original on 23 August 2004. Retrieved 22 December 2009. Wikimedia Commons has media related to Barcode.